The James Proclaims Advent Calendar of Christmas(ish) Films – Door 24 – James Proclaims! It’s Christmas Eve, which is the day before Christmas Day and therefore the day on which one should open the final door of a standard Advent Calendar. And The James Proclaims Advent Calendar Of Christmas(ish) Films is no exception to that rule, and so today we must bid adieu to my Christmas Countdown of festive films. If you’ve missed the previous 23 posts then “welcome to the party pal”. Because today’s post features the only Christmas(ish) film that you really need to watch. Which is 1988’s Die Hard. Die Hard is definitely my favourite Christmas(ish) film. Indeed it’s probably my favourite film ever that doesn’t have anything to do with George Lucas. Die Hard begins with our hero John McClane (Bruce Willis) arriving in Los Angeles to spend Christmas with his estranged wife and kids. As his plane lands he is given some advice by a fellow passenger with regards to his antipathy towards flying. According to this know-it-all, the key to surviving air travel is to take off your shoes and socks upon arrival at your destination and to walk around barefoot on the carpet making ‘fists with your toes’. I saw this film for the first time in my early teens, just months before embarking upon my first ever flight. I held onto this advice and followed it to the letter when I had completed my journey. To what end I still don’t know – it’s not an unpleasant thing to do, but I can’t see that it serves any purpose. I occasionally still indulge in the practice. After all, what’s the worst that could happen? Alas the answer is all too clear. Armed men could invade the building I am in, taking everyone else hostage and leaving me alone to combat them. With bare feet. Which would definitely put me at a disadvantage I’d say. Of course this is exactly what happens to poor McClane, shortly after being reunited with his wife Holly (Bonnie Bedelia), at her place of work, the Nakatomi Plaza, thus highlighting the danger of accepting unsolicited advice from strangers on planes. It’s also an example of just how coherent the plot of Die Hard actually is. Seemingly throwaway moments come back to impact on the narrative all the way through the movie, be it the ‘fist with your toes’ advice ensuring McClane is vulnerable to broken glass later in the story or the seemingly irrelevant machinations of reporter Richard Thornburg (William Atherton) ultimately resulting in Holly being put in unnecessary danger and thus setting up the climax. Every moment in the film, however inconsequential, further develops the narrative in some way yet none of it feels artificial or particularly forced. Strong though the storytelling is in Die Hard though, it is first and foremost an action film and on that score it never disappoints. It’s a rollercoaster ride from start to finish, with some superb set pieces. It’s fast-paced, dynamic and violent but nothing feels gratuitous and ultimately it all feeds into the narrative. Willis, in his first action hero role, is superb. McClane is a man out of his depth, struggling to stay afloat against overwhelming odds but ultimately destined to succeed because of his resourcefulness, quick thinking and resolute refusal to actually die. The title of the movie is completely appropriate. Of course he is still good in a fight, but not so good that you don’t feel he could lose at any point. 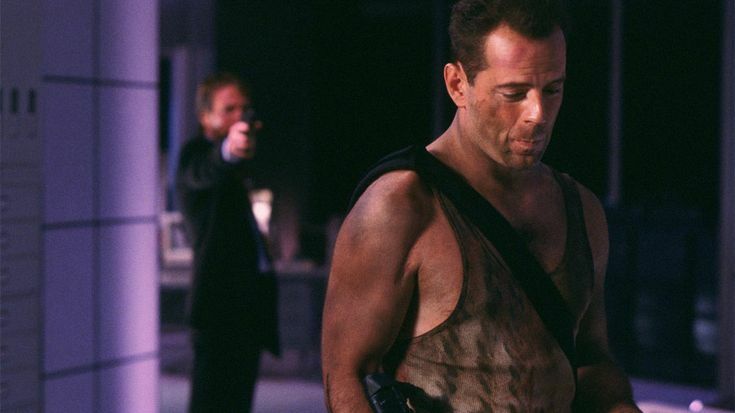 One of Die Hard’s strengths is the vulnerability of its hero. Good though Willis is however, the real standout performer is Alan Rickman. His character, Hans Gruber, is, quite possibly, the greatest screen villain of all time. He is the ultimate foil for McClane, cold, calculating and ruthless. His dispassionate execution of Holly’s boss, Takagi (James Shigeta) sets the tone and significantly elevates the implicit threat he poses to the rest of the hostages. But Gruber is a complex, nuanced character, and Rickman plays him with a wit and charm that makes us, almost, root for him. Ultimately we want McClane to prevail, but in an alternate reality, a version in which Gruber comes out on top might still be a great movie. Although action is very much the main ingredient to the film, there are plenty of laughs to be had, The dialogue is sharp, and both Willis and Rickman have some great one liners but there are plenty of other fun, seemingly innocuous, moments dotted throughout the film, some more explicit than others. For example, during an ill-fated rescue attempt, which has some of the most dramatic scenes and stunning visual effects, scenes where we see both Gruber’s utter ruthlessness and sadistic nature and McClane’s resourcefulness and desperation to preserve life, during these tense and significant scenes we also see a member of the SWAT team accidently prick himself on a bush. It’s a throwaway moment that you could easily miss but catch it and it lightens the mood and reminds you not to take things too seriously – it is just a film after all. Moments after that we catch one of the bad guys, a man who is playing a pivotal role in the ongoing stand-off with the police, deliberate over whether or not to steal a chocolate bar from the concession stand he is using for cover. That he ultimately succumbs and we catch him munching on a Nestle Crunch in a later scene is just another reason to love this movie. There are, to be fair, bits about Die Hard that could be better. Sergeant Al Powell (Reginald VelJohnson) is a huge part of the story, his dialogue with McClane adds a warmth and humanity to the narrative that is often absent from action movies. However, the clichéd backstory about his own personal tragedy is unnecessary and his redemption, which ultimately involves him shooting and killing a man, albeit a very bad man, is a bit unsettling really. It could also be argued that the authorities in general, and in particular Deputy Chief Dwayne T. Robinson (Paul Gleason) and the FBI Agents Johnson and Johnson (Robert Davi and Grant L Bush) are just a bit too stupid to be plausible. I’d argue, however, that in a world where far too many people are promoted to their own level of incompetence, Dwayne T. Robinson is unfortunately all too credible as a character, but more to the point, the relative stupidity of the police is fine because Die Hard is a work of fiction and best enjoyed as pure escapism. Take Die Hard too seriously and there are all kinds of holes to find in the plot, but everything makes sense within the reality of the movie, and that’s all you can ever truly ask of any action flick. And to be fair, if, in spite of everything, Die Hard is just another action movie, it is an exceptional action movie. I love this film so I’m inclined to be generous, but actually it really is quite Christmassy. I suppose McClane could be flying in to visit his family for any major holiday, but Christmas does seem like the most appropriate. The office gathering which permits the bad guys to seize the building relatively unchallenged makes the most sense as a Christmas party, and the festive season does explain the slow response of the emergency services to the hostage situation. There are other Christmassy moments throughout the movie, not least McClane’s creative use of Christmas gift wrap to conceal a firearm at the denouement, but my favourite is when Gruber reassures one of his minions that his plan is going to work in spite of overwhelming obstacles. You probably could enjoy Die Hard at any time of year, but you shouldn’t. It’s definitely a Christmas(ish) film. And that’s it for this year’s James Proclaims Advent Calendar Of Christmas(ish) movies. I’ll no doubt be writing a few festive posts over the next week of so, as I tend to do at this time of year, and then it’ll be back to normal in 2018, whatever ‘normal’ is. Although I have enjoyed doing the film reviews, so that might be something I do again in the future. I’ll definitely be doing another Christmas(ish) film themed Advent calendar next year – I’ve already identified more than enough films that I didn’t manage to get to this year, including the excellent-but-not-quite-as-good-as-the-original follow-up to Die Hard, which is also a Christmas themed festival of mindless action. I’m totally with you on this one. We watch it often, and no doubt we will manage to catch it again this Christmas. Hope you and yours have a great Christmas. Looking forward to catching Bruce in the remake of the Charles Bronson classic DEATHWISH in 2018. Full marks for identifying this as THE best Chrimble movie! There’s much chatter on Twitter that it doesn’t even qualify for the category. Pfft! Die Hard, Love Actually and Rare Exports are my top 3. Have a good one – may it be merry, bright and full of mince pies and trifle! Have recently been told off for never having seen Love Actually – I was living abroad when it came out and kind of missed it the first time around, so will be making an effort to catch it this year (obviously have to watch is at Christmas…) Have a great Christmas yourself! I’ve already demolished plenty of mince pies and today I enjoyed one with some mince-pie ice-cream on the side! Definitely recommend int! I’ve really enjoyed this series of posts – didn’t realise just how many films revolve around the holiday season. I’d love to see articles of a similar theme in the future. Thanks – and yes there’s loads of them – already got another 24 lined up for next year. Merry Christmas Tom! Pingback: Boxing Day Bargains – James Proclaims! Pingback: Films I Watched When I Was Younger – Issue 5: Under Siege – James Proclaims! Pingback: The Second Annual James Proclaims Advent Calendar of Christmas(ish) Films – Preamble – James Proclaims! Pingback: The Second Annual James Proclaims Advent Calendar of Christmas(ish) Films – Door 24 – James Proclaims!